This was my first novel. It began with a half-page description I wrote about a dragon trapped in an old barrow grave. Months later, when I reread it, I felt inspired to create a story round it. I worked on the story between 1995 and 1996, then revised it a couple of years later. All my novels contain some kind of conflict between fantasy and reality, and in Buried Fire, the conflict is literal and violent. There’s a nasty dragon, friendly neighbours with sinister powers and, for Michael MacIntyre, an internal struggle between good and evil. For me, titles are almost the hardest thing about writing a book. For a long while the working title of this was The Four Gifts, which wasn’t hugely exciting. The problem stayed unresolved until the morning that the edited manuscript had to go to the printers. I went to a park, sat under a tree, and in desperation wrote out as many different possible titles as I could think of, one after the other. Some were silly, most were dull. But the 31st idea on the list was 'Buried Fire' and I knew immediately it was right. 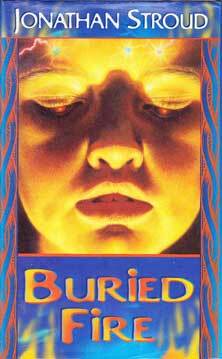 This is the original UK cover (1999). 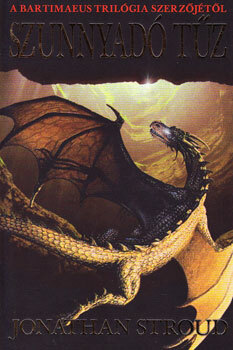 I wasn’t entirely convinced by it, and was pleased when it was re-jacketed with the close-up of the dragon's eye.